Today I’m thrilled to introduce Leonie and Elly, a mother and daughter team from Melbourne who created Diabetes Meals Online. I’ve known of them for quite some time thanks to social media, and today they’ve taken some time out to chat with me about their connection to diabetes and the business that came from it. Frank: So, you’re a mother and daughter team. Can you tell us a little about your connection to diabetes? Leonie: Elly, my daughter, was diagnosed with type 1 diabetes in 2013 – a complete shock and we both struggled with the diagnosis for the first 6 months. I thought I must have done something wrong during pregnancy and she was in shock – we knew nothing about diabetes back then. She had 4 hospitalisations in ICU in the first 18 months and she is now managing really well and hasn’t been to hospital in a couple of years. I bought her a Dario about a year ago which she loves. She is too old for the funded CGM and pump but we intend to get her one as soon as we can. Frank: You’ve since established Diabetes Meals Online together. Where did the inspiration for that come from? Leonie: We both hate cooking and found trying to read the nutrition information panel of every ingredient really tiring. Elly and I, and my dad, who loved cooking, decided to try and make meals with clearly colour coded carbs and sugars to make meal times simpler for people managing diabetes. We bought a dietitian on board to design a strict nutritional criteria and a couple of years later bought an Educator on board just to check that our message was ethical and not offending anyone. Frank: Diet can be a pretty controversial topic in the diabetes community. What sort of dietary inspiration or guidelines have you drawn upon in creating your own product? Leonie: Yes it sure can and we want to remain ethical and trustworthy thus our dietitian and diabetes educator advise us on all things medical. I follow lots of diabetes groups and am pretty active on social media watching what authorities are posting and staying up to date. We never, ever give medical advice – we always point people back to their own health professional for individual advice. We don’t (and would never) claim our meals help manage diabetes – but simply make meal time choice easier. Frank: I’ve seen that your meals are pressure cooked, sealed and can be stored in the pantry for up to two years. Could you tell us a bit more about the process involved in producing the meals? Leonie: Yes, it’s called Retort and is very popular worldwide. We are a bit behind here in Aus but Heinz use the same process for their soups and baby foods. All the fresh ingredients are put into the special pouch which is then sealed. They are then pressure cooked in a huge pressure cooker. This locks in nutrition, flavour and aroma and makes them commercially sterile meaning they have the long shelf life and don’t need refrigeration (until opened). Frank: What has been the most valuable thing for you both in terms of living with diabetes? Leonie: Hmm – tough one. I think for Elly, over the past couple of years, she has realised that it is not going to stop her living her life the way she wants – she just has to deal with things that people without diabetes would never even think about. For me it has been offering a meal option for others to help make that meal time easier – there is enough to deal with in diabetes and when I read all the customers ‘thanks for providing such a valuable service’ I’m really touched – and proud! Leonie also sent me some meal samples to try, and I wasn’t really sure what to expect as I have never used a meal service before. The meals arrive pressure cooked and sealed, and can simply be kept on hand in the pantry until needed. Heating up is as simple as making a small perforation in one of the top corners of the packet to allow for steam to escape, and then placing in the microwave on high for 2-3 minutes. Carbohydrates, sugar content and calories are at the forefront of the packaging, along with the usual nutrition information panel. The ingredient list was also very easy to read! The meals are clearly designed to meet the body’s energy needs and nutrition criteria, and include a balance of carbohydrate, fat and protein in each serve. The carbohydrate content ranged from 19 to 30g per meal, which probably won’t be an option for those following low carb diets. The meals are gluten free, however, which is a great option for type 1s with intolerances or coeliac disease. 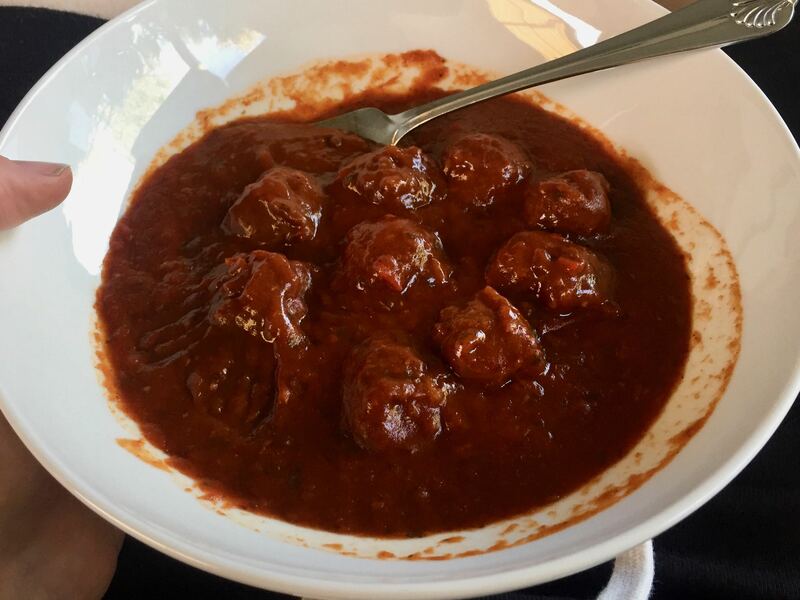 Chunky Italian Meatballs in Herbed Tomato Sauce. After cautiously inspecting, preparing and smelling this strange new product, I was pleasantly surprised. The flavours were there and it tasted like a freshly prepared meal. 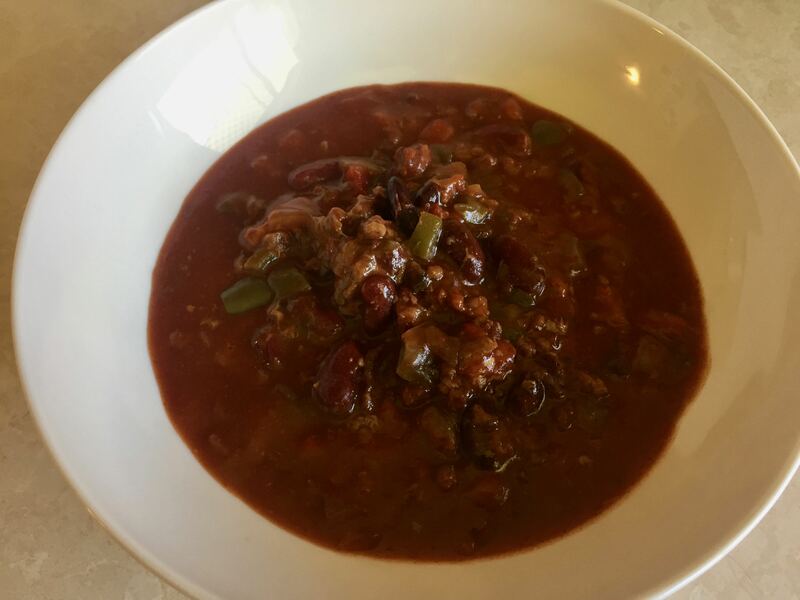 The seasonings were a little strong for my liking when I tried the meatballs, however my second meal of Chilli Con Carne was much more enjoyable. I’ve still got the Mild Butter Chicken to try. You can find Leonie and Elly’s range of meals available at diabetesmealsonline.com.au. They deliver Australia wide. Disclosure: Leonie sent me three meal samples to try. 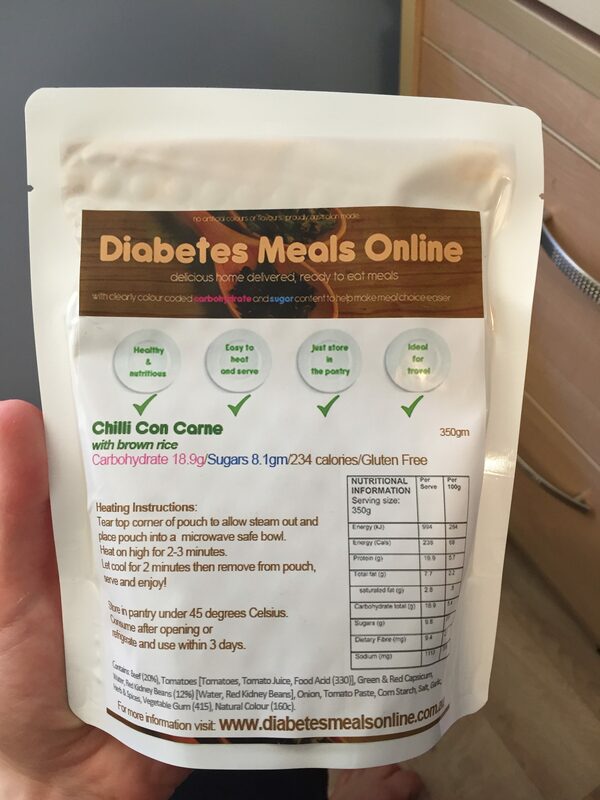 There was no expectation that I would blog about Diabetes Meals Online, and all thoughts expressed here are my own!